Re-introducing cotton seed oil as a cooking choice and showing the way to provide the salt and spice flavor with no added salt or pepper, Botham Brands of Wisconsin is launching Alcala Farms cooking oils, with the help of Cotton Incorporated. In a cooking demonstration by Marriott chef Donald Hoffman, members of the agricultural media were treated to Salmon Salpicon (with Jalapeno Lime and Cilantro Cottonseed Oil), Sauteed Chicken Breast with Honey Chipolte BBQ Sauce (featuring Garlic Cottonseed Oil) Pecorino Cheese and Habanero Cottonseed Oil. The event, held as part of the Beltwide Cotton Conferences, was highly popular to say the least! Five flavor-infused cottonseed oil and pure cottonseed oil are being branded as Acala Farms by Botham Brands in Wisconsin. "Re-introducing cotton as a food crop is high on the list of priorities for Cotton Incorporated," says Tom Wedegaertner, director of cottonseed research and marketing for CI. "Our collaboration with Acala Farms to introduce these oils is just the beginning of this initiative. We have several more that we're hoping to introduce under the name." Five Southwestern flavored oils -- Fresh Roasted Garlic, Smoky Chipolte, Fresh Cilantro, Jalapeno-Lime and Hot Habanero--were chosen because of the San Antonio introduction plans, Wedegaertner explained. "Six more flavors are in the works and should be on the market within the next six months. 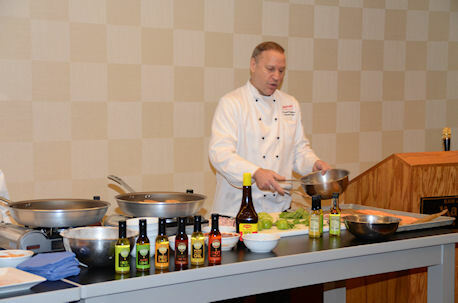 Marriott chef Donald Hoffman creates three tasty sample dishes with the flavor-infused cottonseed oils during a press demonstration at the recent Beltwide Cotton Conferences in San Antonio. Sarah Botham, president and director for Acala Farms says cottonseed oil is high in antioxidants, has no transfat and no cholesterol, making them high on the "heart healthy" cooking oils. "A high smoke point means the oils won't burn, scorch or disappear in the pan," she adds, "so they're great for frying, searing, sautéing and stir-frying. And, the flavor you want is the flavor your get." Cottonseed oil has no inherent flavor as do some other cooking oils. The oils are currently available at the Acala Farms website, www.acala-farms.com.